It is a fruit bomb full of B vitamins, which are equally crucial for the skin and nerves. Vitamins A and C, it also contains hematopoietic iron, calcium, and potassium, which has a draining effect, it works naturally to make your skin glow. The skin benefits from this wealth of vitamins and enzymes in external applications: a pinched complexion with clogged pores clean the pineapple in no time and gives it a rosy touch because the fruit removes dead skin cells, dirt, and grease in no time. It is essential that you buy a ripe pineapple, as it belongs to the nuts that do not ripen after harvesting. This exfoliation makes your skin wonderfully soft and smooth. ⇒ Cut the bowl into wedge-shaped pieces that are easy to hold in your hand. In the shower or the bath, rub the whole body with the pieces of skin, then rinse thoroughly. After exfoliation, your body is thirsty. It’s best to cream yourself liberally with moisturizing lotion. Maybe you try the peppermint body lotion. By this way: Since the pineapple contains a lot of fruit acid, you should not apply this scrub in the face. 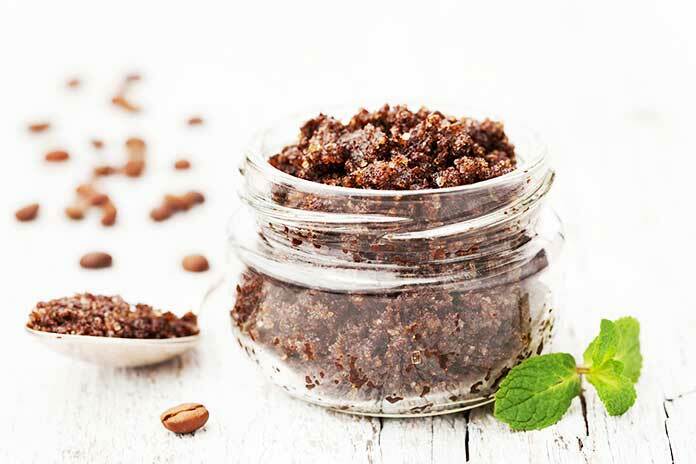 Body scrub for oily and large-pored skin. The shedding has an astringent effect, that is, it contracts the pores and refines the complexion. Chop the pineapple in a blender and place a bowl. Sprinkle the cornflour over it and add the oil. Mix the whole to a thick porridge. If the fruit mix is too fluid, add some flour, it is too tight, possibly add a few drops of apple cider vinegar. Apply the pineapple in the shower. Briefly shower off, then put some of the exfoliations on a loofah or terry glove and massage into the skin with circular movements. Repeat until your whole body has benefited from this preferential treatment and the peeling is used up. If your skin does not stretch, you no longer need lotion after this treatment, because the olive oil makes the skin supple. This formula soothes dry, rough skin, leaving it supple, making it ideal for treating cuticles on fingers and toes. Mix pineapple juice and egg yolks thoroughly. The quantity is sufficient for the method of the feet or the hands. Put the mix on the cuticle and let it work for 5 minutes. Then gently push the skin back toward the nail bed with an orange wooden stick. 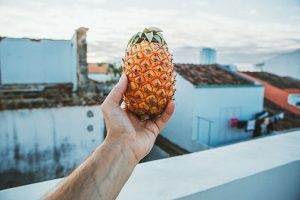 Pineapple, health benefits: from diuretic to decongestant, here are all the beneficial properties of this extraordinary exotic fruit. 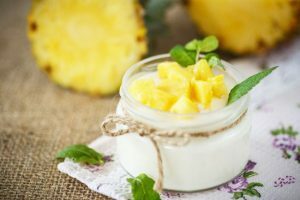 In addition to its goodness that makes it a fruit particularly suitable for many recipes, pineapple is a real concentrate of beneficial and therapeutic properties. 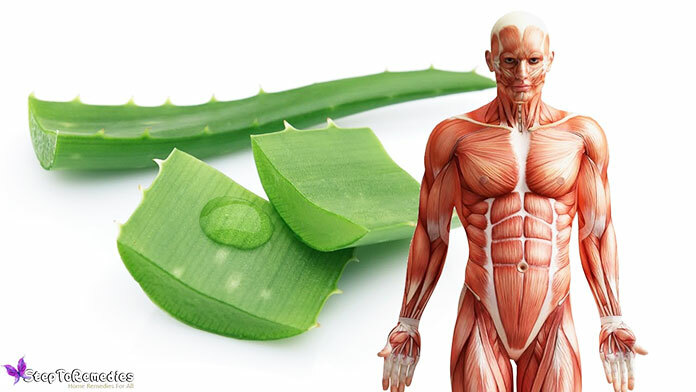 It is a rich source of antioxidants and essential nutrients that improve the health of our body. 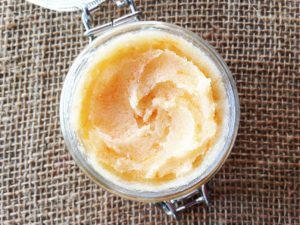 As like pineapple aloe vera gel is the best source for skin exfoliation. Why Does The Pineapple Bring Several Benefits? In addition to its remarkable healing properties, pineapple is known for its high content of vitamins C, B1, B6, folic acid and mineral salts such as sodium, potassium, calcium, magnesium, and iron. 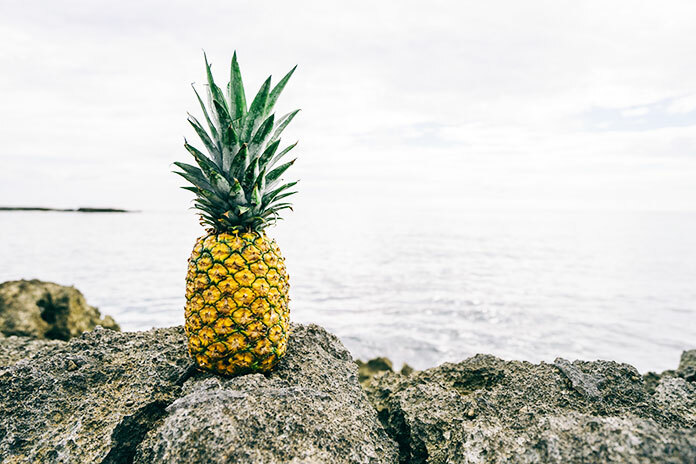 The pineapple is made up mainly of water and fibres; for this reason, it is low in calories and therefore an ideal food for those who follow a diet. The majority of the benefits of pineapple is due to the presence of an enzyme called bromelain, a protein that can improve digestion and destroy intestinal parasites. Pineapple bromelain has an anti-inflammatory, antithrombotic, anti-edematous and fibrinolytic action. According to experts, this enzyme would be able to act as a natural anticoagulant and cause positive changes in white blood cells. Furthermore, recent studies have determined that bromelain and pineapple antioxidants may be anticancer. The great resource of vitamin C helps to prevent seasonal ills such as coughs, colds, flu, and sore throats. Many fruits, after being picked, continue to mature, but the pineapple is not. To find out whether it has been harvested ripe, it is necessary to observe the peel, if it is too green or too brown. In the first case, it is not very mature in the second case it is too mature. To be ripe at the right point must be a good shade of orange and have a pleasant smell. The pineapple should not be cooked but eaten raw, cooking but also the syrup will lose this fruit almost all its beneficial properties.